Wood doors can be sticky, but the repair doesn't need to be. If your doors have been a little temperamental lately, try one of these fixes to get them opening freely again. In my house, several of our wood doors keep sticking. I’ve tried candle wax and have made sure all the screws in the door frame are tight, but the doors are still sticking. Any advice on how to fix a sticking door would be greatly appreciated. Thanks! In a situation like this, sometimes the door itself is to blame. Over time, joints in a wood door relax, causing the construction to sag and stick against the jamb. A more common cause is a hinge or strike plate that has become loose. But you’ve mentioned that the screws are tight, presumably in both the door and the jamb. So, although failing hardware is typically the first thing to check when a door is sticking, that doesn’t seem to be the cause of your predicament. I’d speculate that humidity is the issue. Doors usually stick in summer, when relative humidity is high. The moisture expands the wood, making your doors too tight in their frames. In the winter, humidity levels are usually lower, because cooler air cannot hold as much moisture. If you have better luck with these doors in the cooler months, it’s simply because environmental factors are not causing them to swell. What you should do is buy a hygrometer and take a reading of the relative humidity indoors. Common causes of high humidity include wet basements and improper use of the bathroom or kitchen vents when bathing or cooking, respectively. If you happen to have a lot of houseplants, that too might add to the humidity, particularly in combination with other factors. So check the hygrometer reading, and if the reading comes in at over 70 percent, there’s your explanation. Get the humidity down, and you’re likely to find that those annoying doors finally unstick on their own. If getting the humidity down isn’t in the cards, then you can always trim down the door panel. Concentrate on the problem edge, the one that rubs against the jamb; you can usually identify it by the worn finish. Ultimately, the space left between the door and jamb should be about 1/8 inch wide, or roughly the thickness of a nickel. As a test, open and close the door with the aim of identifying the precise area where the problem’s occurring. Use a sharp pencil or carpenter’s compass to scribe the panel where it rubs against the side or top of the jamb. Having drawn a line on the door, proceed to take it off the hinges and carry it somewhere you feel comfortable kicking up a little sawdust. Next, use a hand plane, power planer, or belt sander to shave off the excess material. Remove only the minimum required for the door to close. (When the panel shrinks in winter, you don’t want there to be a big gap between the door and jamb.) Now put the door back into place and check the fit. A certain amount of trial and error is almost inevitable with this task, even for people who’ve done it before. You may need to remove the door again in order to sand off a little more. Keep at it until you’re satisfied. 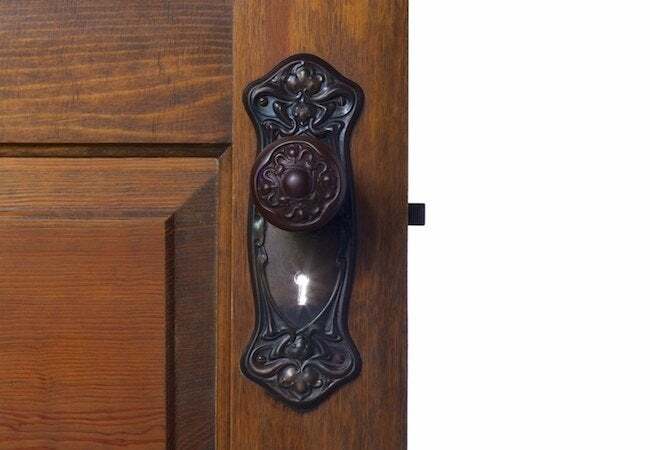 Once the door fits well and you’ve managed to achieve an approximately 1/8-inch reveal, you’re ready to refinish the part of the door that you’ve planed. You can either remove the door or finish it in place, but time is of the essence. The door wants to swell up again; refinishing limits its capacity to do so. If the humidity is under control and you’ve already tried trimming your doors, then it’s possible you’re seeing a symptom of foundation settlement. Unfortunately, foundation problems are not DIY-friendly repairs. Consult with a foundation repair specialist. Fair warning: Foundation repair work is rarely cheap, but it’s in your best interest to understand precisely what problems, besides sticking doors, your foundation may bring about in the future.